It's my pleasure to welcome Charlotte Russell to the salon today; Charlotte brings us the tale of the education for the deaf in the long 18th century, and news of a wonderful new collection of fiction! 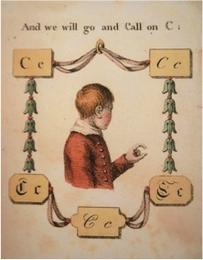 This enlightened book was published (anonymously) by a parent whose child attended Thomas Braidwood’s Academy for the Deaf and Dumb in Edinburgh. Braidwood, a teacher by trade, established his school in Scotland in 1760 and was one of the first to use a formal language of signing that was a precursor to British Sign Language. 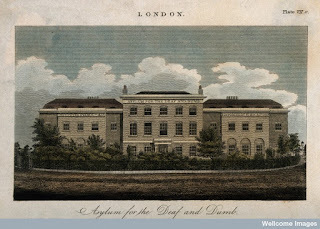 He moved to London in the 1780s and established another school for the deaf there. A relative, Joseph Watson, became headmaster of the London Asylum for the Deaf and Dumb, which opened in 1792. Prior to the founding of these schools, the education of the deaf was sporadic at best, though there is documentation of a finger alphabet dating back to the 15th century. After decades of evolution, a manual alphabet was codified at last in the publication of Digiti Lingua, written by an anonymous deaf author. This British alphabet, which is two-handed and therefore different from the one-handed alphabet which developed in the United States, survives to this day. Interestingly enough, it’s not only the British and American finger alphabets which differ. When the American Thomas Hopkins Gallaudet visited England in the hopes of learning about the education of the deaf from Thomas Braidwood, he was turned away when Braidwood refused to share his methods. Gallaudet then traveled onto Paris where he received a warmer reception and spirited cooperation. In consequence, American and British Sign Languages are very different from each other and only partially comprehensible to a signer of the other. Put two people in a room and despite any and all language barriers, they will communicate somehow! Charlotte Russell didn’t always know she wanted to be a writer. At one point she had grand plans to be an architect, until she realized she couldn’t draw anything more complicated than a stick figure. So, she enrolled at the University of Notre Dame and studied her first love—history. Now she puts all that historical knowledge to good use by writing romances set in Regency England. When not pounding on the keyboard, she enjoys watching sports with her husband, chauffeurs her three kids around, volunteers for too many things, and entertains two cats. (Of course there are cats; she’s a writer.) Although she has previously resided in Indiana, Mexico City, Phoenix, and Seattle, she currently lives right in the middle of the country in St. Louis. 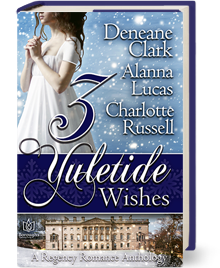 Meet my heroine Isabella, who will not be silenced, in The Kissing Bough, part of the 3 Yuletide Wishes anthology. Written content of this post copyright © Charlotte Russell, 2016. Fascinating information! Looking forward to reading your story! Good for your heroine! there are increasing numbers of us using disability in our characters to highlight points that need making! You might also be interested in this link to Kat Kane's blog where she mentions an abcedarium with sign language depicted as part of the book, and I've seen a facsimile and it's identical to modern BSL letters. 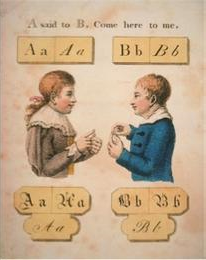 It was great when Gallaudet brought French sign (now called American Sign Language) to the deaf in America. Before that it was mainly Home Sign, each deaf developing his/her own way to communicate within the family. There were efforts at unification and an alphabet and some regional signing--that even carries through now in ASL with different regions having slight differences. But for the most part it is now possible for the deaf in California to attend Gallaudet College and communicate freely with the deaf from all areas of the country.